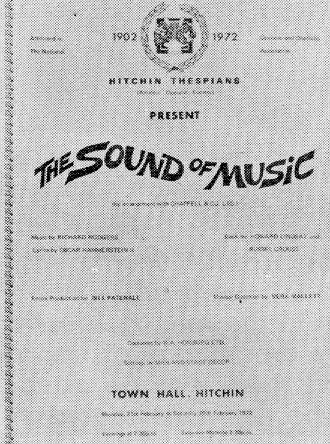 1972, the Thespians' Seventieth Anniversary year, was marked by an extra production at Hitchin Town Hall in February, when 'The Sound of Music' was performed to enthusiastic audiences. 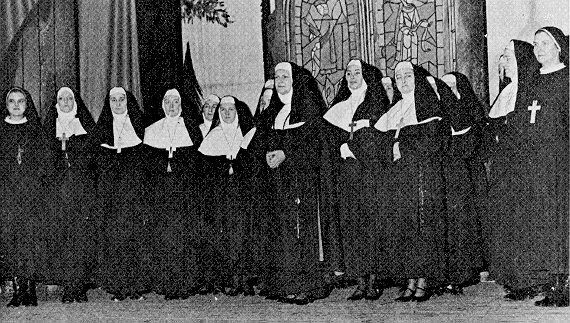 The show, produced by Bill Patenall, gave the Thespian ladies a chance to show their paces and the splendid sound of the chorus of nuns was especially admired. Again, the tickets had to be 'rationed' to ensure fair distribution. There were other, technical difficulties, too. A political crisis resulting in power-cuts and severe restrictions threatened the cancellation of the production. Eventually, it was decided to go ahead with the show, but the continuing difficulties made each performance a perilous adventure. Resourceful members, however, supplied stand-by generators, supplemented by car headlights fixed to batteries bought specially for the occasion. If the lighting was at times subdued, the singing was as powerful as ever.. The children were remarkable and six-year old Kate Whitmore - surely one of the youngest members ever of a Thespian cast - never faltered when a black-out occurred in the middle of her solo and the emergency supply was switched on. Ian Caddy renewed his association with the Society when he sang the bass solos in two performances in April of Haydn's 'Creation', in St. Mary's Church, Hitchin. This was an especially successful venture, in which the Thespians were accompanied by an orchestra. The local press was loud in its praises of 'the Thespians' spiendidly rousing, indeed, inspired singing'. 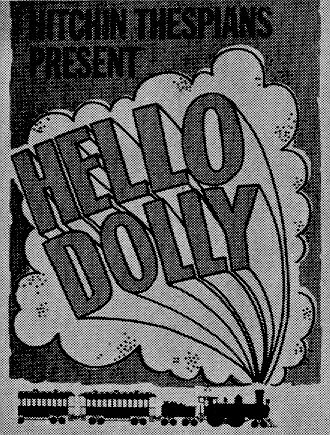 The final production of the anniversary year was 'Hello Dolly! ', staged at St. Francis Theatre in November. Once again, Vera Mallett and Bill Patenall combined to present a show which filled every house and was warmly reviewed in the press. One critic, Jon Madge, wrote 'Like being soaked in a burst of warm autumn rain, I was drenched in the satisfaction of having enjoyed myself so much'. For the cast, the show was memorable for the Waiters' Gallop and strenuous gymnastic feats which resulted at one rehearsal in the complete destruction of a tea trolley! On another occasion, the doctor had to be called to deal with results of a particularly spectacular leap-frog! The seventieth anniversary year was also marked by a dinner at which the guest speaker was the well-known B.B.C. news-reader, Richard Baker. It was on this occasion that Mr John Edwards, the district representative of the National Operatic & Dramatic Association, and an old friend of the Thespians, presented the Thespians' President, Muriel Bendail, with the Association's long-service medal. 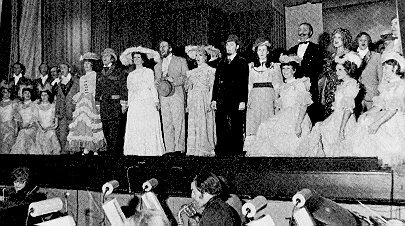 Another 'Mallett Special' - 'Vienna Nights' - narrated by Stan Taplin in the role of Johann Strauss Ill, was presented at the Town Hall, Hitchin, in April, 1973. The programme of music associated with the Austrian capital proved enormously popular and there was no doubt that the pattern began with 'The Story of Gilbert & Sullivan' with the audience seated at candle-lit tables, and fortified with food and wine, had great appeal. Arthur Peters, writing in 'Hertfordshire Countryside', had this to say about it: 'Lavishly costumed and jewelled, the barge choir presided over an atmosphere which, with tables scattered about the floor of the hall and service by immaculate waiters, was as near to 'Gemutlichkeit' as one could find in this country'. 'Another seldom-seen show, THE MOST HAPPY FELLA, was presented by Hitchin Thespians, always on the lookout for a challenge ... all went well, the limited chorus work receiving typical Thespian treatment. Being a lesser-known title, box-office suffered somewhat, but the Society nobly took this calculated risk, and are to be congratulated on the result'. Praise, indeed, and especially gratifying in view of the adverse effect on rehearsals of yet another political crisis - with resultant power-cuts - a General Election and a bad winter. For the autumn show, the Society had a new producer, Margaret Madison. Miss Madison, a member of the production staff of Associated Television and a former professional dancer, had had wide experience as a producer for N.O.D.A. Her colourful production of 'Night in Venice, based on the music of Johann Strauss was well enough received by the November audiences at St. Francis Theatre, but the show could not be said to have had the appeal at the box office that had been hoped for.